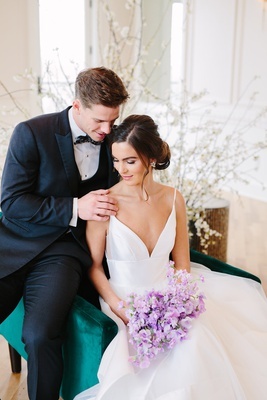 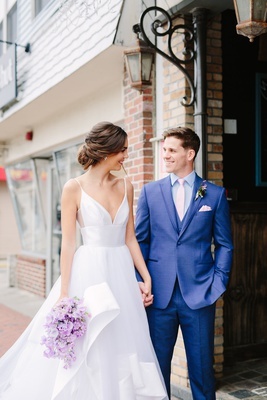 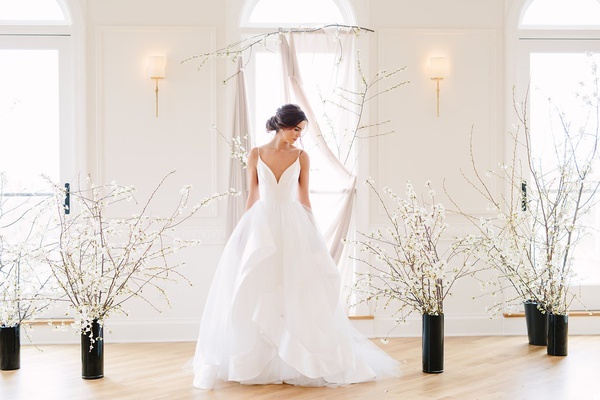 “We have been seeing a lot of blush and gold and wanted to show brides the endless possibility that you could do with silver – a bold color and a very soft hue to get that stunning, yet romantic, feel,” shares the design team of their vision. 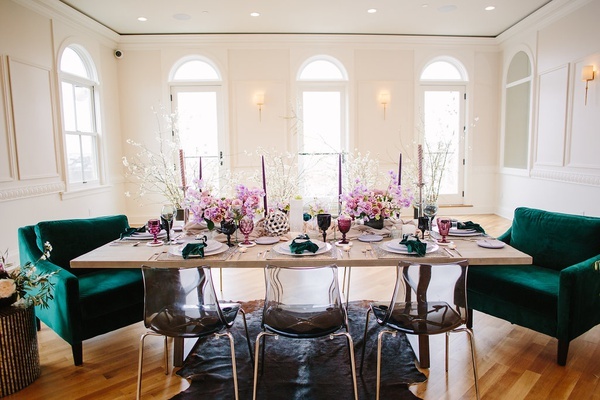 To pair with the metallic accent, emerald green was selected as the dominant shade with violet as the secondary color. 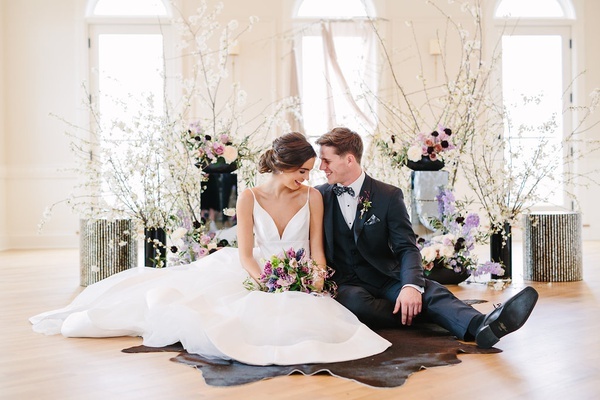 The ceremony site had a moody aesthetic, from sprawling branches of quince blossoms to transparent black chairs, with a rustic cowhide rug serving as a partial aisle runner. 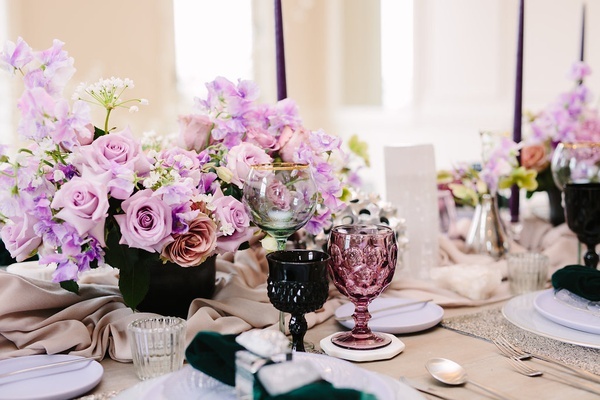 For the reception, the base of the tablescape was a simple rectangle, but the décor was anything but. 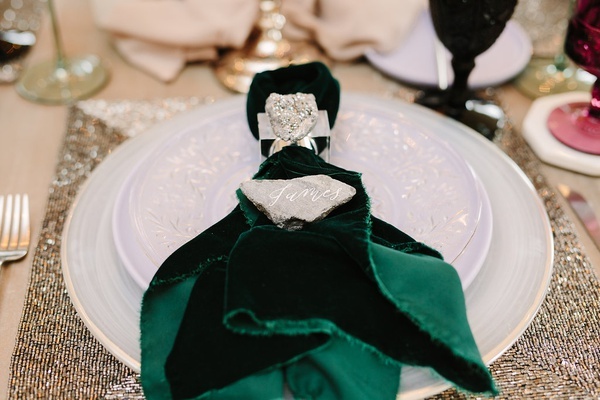 Deep green velvet squares were held together by silver napkin rings, while pieces of rock embellished with white calligraphy made for unique place cards. 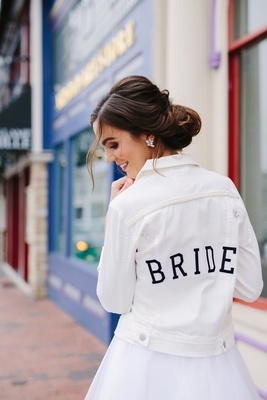 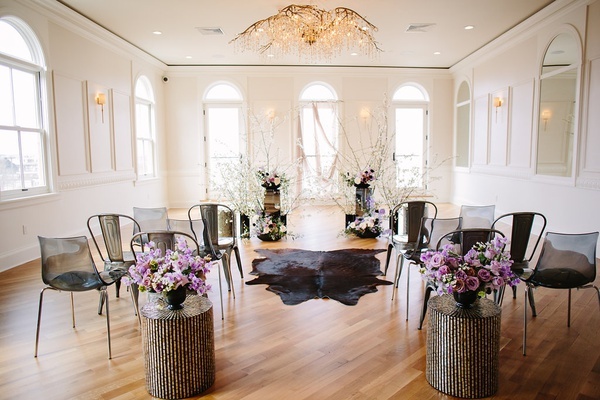 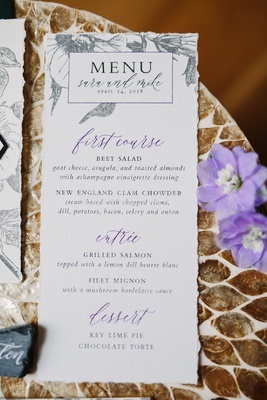 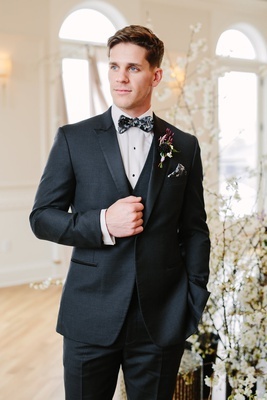 “One thing I love most when designing is adding in texture,” reveals the event designer. 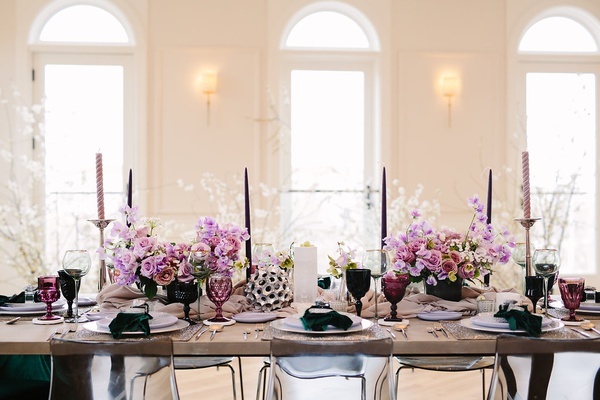 “I love the look it brings to any setting, and the awe of looking at the table to only see something new that you didn't see before is what I strive for." 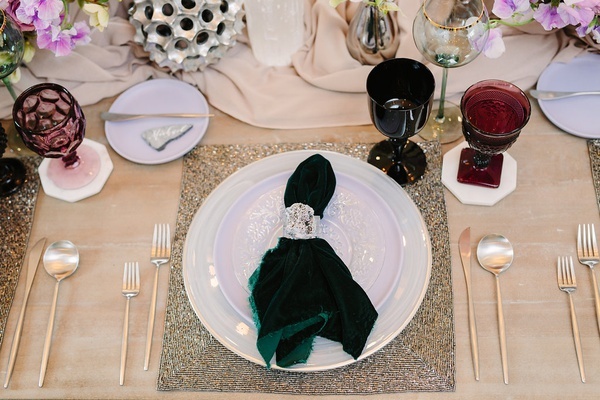 Emerald green was brought in through chairs, napkins, and goblets, while silver was featured through the smaller details. 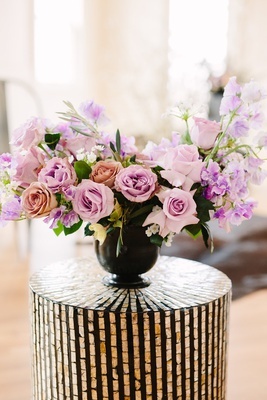 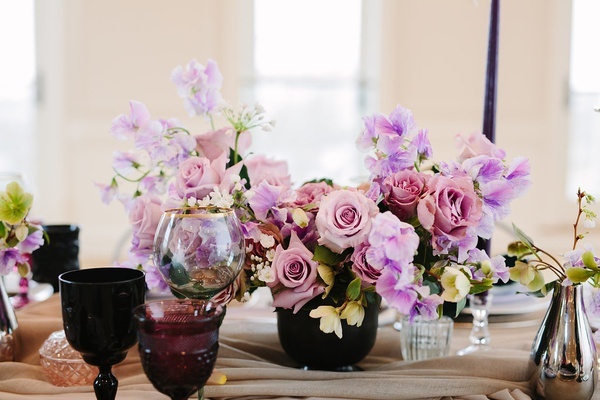 Flower arrangements are where varying hues of violet made an appearance, through roses and delicate sweet peas. 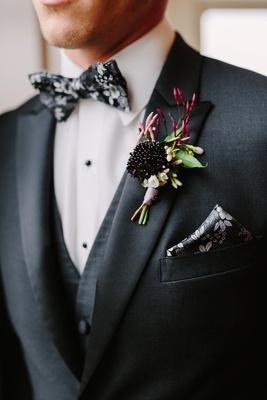 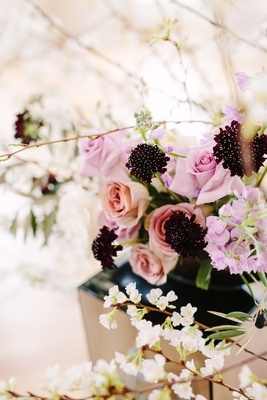 To provide contrast and tie in the edgier style seen through various design elements, black scabiosa blooms were interspersed throughout the softer blossoms. 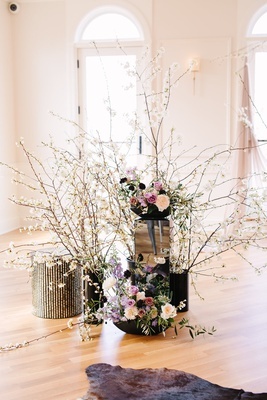 A four-tier cake fully represented the look of the styled celebration. 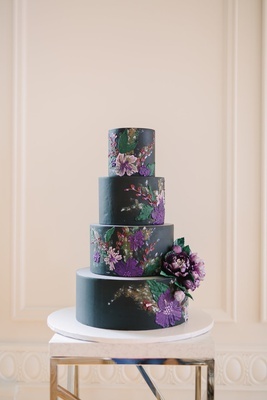 The base of the fondant was a soft black while additional frosting had the effect of a textured oil painting in order to add purple and lavender flowers to the confection. 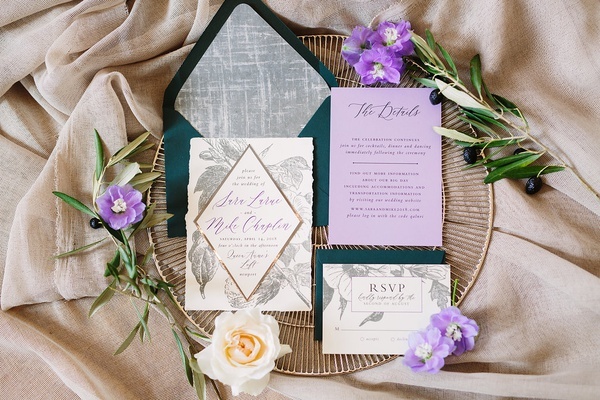 Take a look at the inspiring details in the slideshow above!